I’ve been doing a lot of thinking lately about frugality and what it means to be frugal. I’m far from being an expert in frugality, but being (almost) frugal is a big part of my life. My frugality comes, in a very large part, from necessity. We don’t have a lot of money, and if I don’t force myself to pay close attention, our budget seems to trickle through my fingers without my noticing. But I am also frugal from conviction. I think that frugality is important, and I also believe that it is important to try and conserve resources, from an environmental standpoint. Many of the frugal things I do, fit into both categories, economic and environmental, whether I intend for that to be the case or not. And usually, that’s a bonus. There is one frugal thing however, that if I had any real choice in the matter I would stop doing in a heartbeat. Hanging the laundry. I’ve said it before and I’ll say it again. If I could fit a dryer into my house, I would buy in a heartbeat, extra cost and environmental impact be damned. I know dryers cost more money than hanging laundry on a rack, and I know that dryers use lots of electricity, which is, all in all, a limited resources. So in a way I’m glad that I can’t find a place for one in my house. But still! I hate hanging laundry, and if I could give it up, I’d gladly call myself ‘Nearly Almost Frugal’. How about you? What frugal habit would you give up if you had a choice? If money was no issue, and you could choose to be frugal out of conviction, not necessity, what would you stop doing? 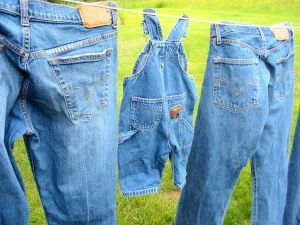 When I was younger and lived at home my mom always made it one of our chores to hang the laundry outside and remove it. lol. I didn’t mind too much (and I did enjoy the smell of fresh laundry) but I don’t think I’d do it myself. For one thing, we don’t have a yard (live in a condo) or really any room to hang clothes. I do hang the occasional delicate…. The one thing I would love to give up being frugal on is the AC/heater. If it didn’t matter, I’d have the AC on more in the summer so it’s nice and cool (not just tolerable) and in the cold midwest winters I’d have it nice and toasty inside! I would have TiVo. There are shows I enjoy watching that are on in the evening while I’m trying to make supper and reconnect with my husband after he gets home from work. It would be so nice if I could linger over those shows after my walk in the morning while I’m resting and eating breakfast. I agree with Carolyn. In my less frugal days, I did have a housecleaner. I would have a monthly treat -like a massage or manicure or fancy dinner. Oh, and cable. I’m really starting to miss watching television even though I know I’m better off without it. Cleaning house. I despise it. I'd hire a maid or housecleaning service. I would have to go with the housekeeper. Or at the very least a dishwasher. God, how I despise the dishes. Lucie’s last blog post..Mommy Meltdowns – How Do You Handle Those Moments? Paper plates. Occasionally I would love to serve dinner on paper and then just pitch everything in the trash. It wouldn’t be THAT expensive but my conscious has a hard time dealing with adding the unnecessary into the trash pile. Ooh, I should look into that. It sounds much more reasonable than I expected 🙂 Thanks 1hottiredmama! I think that 1hottiredmama has raised a good point. We shouldn’t forget to give ourselves little luxuries from time to time. OK, so maybe I can’t have a dryer, but that doesn’t mean that I can’t reward myself with a glass of wine after I finish hanging the laundry out to dry (after i get off the internet, that is!). Is chocolate ever unnecessary though, really? I probably buy a lot of unnecessary chocolate. As for other frugality, I think I'd stop if it was taking up an unreasonable amount of time and not necessary. Like you, I would practice certain frugalities even if we could easily afford it. But sometimes being frugal is so time-consuming that it's not worth it in terms of quality of life. Ah I love hanging out the laundry! I can think of more things I’d like to do than I’d like to stop doing if money weren’t an issue. I’d love to be able to go out to eat more, and to travel more. I’d be willing to do all the frugal things if I could do those two more! I would stop cooking my own food. It was a lot easier to have someone else cook for me, but I’m saving a lot of money by not going to restaurants. If money weren’t an issue I would go back to Weight Watchers’ meetings. I enjoyed the atmosphere, and found them helpful. However, I couldn’t justify $40.00 a month for one hour a week! Especially, when solo fitness and exercise is free. I would indulge myself like MAD at the jewelry store and clothing store. I have a self imposed “that’s so bourgeois” attitude if I indulge in a small splurge at the mall. I think to myself ” I’m wearing THIS and children are going hungry? Animals are dieing?” I just can’t justify it. So I trod to the funky retro second hand boutiques and indulge myself there instead. And I feel better about that! With that money I’ve saved, I can do some good; I can spend it in a much wiser way; for food, perhaps. I can donate a bit, perhaps. BUT if I had no internal conviction, I’d gladly splurge on that dress! It’s not so much about what I would stop doing, but moreso what I’d start doing. If money weren’t an issue, I think I’d like to eat out more often. I hear great things about many local restaurants and would love to try them all out. There are other things that I’d like to say that I’d do (like buy more new clothes, replace some old furniture) but really I don’t think I would. Eating out though, that’s something I could see us doing once a week if money wasn’t such a big part of the equation. Great question! I'd send my work clothes to the dry cleaners and get a cleaning service for the house each week. I struggle with both things a lot. We *could* afford those extra services, but once you start, it's hard to stop! So, I keep at it myself. i would go to the salon for facials again. 🙂 it's just such an unjustifiable expense! ridiculous! it makes no sense to cut back on spending but then spend $65 on skin care. so i don't . but i miss it sometimes. Maybe the answer is to ask for those things as gifts (and stay tuned for Wednesday and Fridays’ posts). A friend gave me a gift certificate to a spa for my daughter’s birth (ten months ago) and I only just recently used it for a facial and a manicure. But it was so worth it and the memory of that experience will stay with me much longer than any physical object could. oh me too! I would so love a clothes dryer! I am so busy that by the time I get home it’s always dark and now that it’s winter here in Oz, the clothes are 9 times out of 10 all wet. shiny’s last blog post..Too too too too…. I agree completely with Mrs. Micah. I try to save money, and I do a lot that other people might not, but I do consider cost vs. time and quality of life. For example, I have cloth diapers, which I have used and could use again, but for a batch of two dozen diapers, I’m spending well over an hour rinsing (my son messes almost every diaper), washing, hanging, and folding diapers, to save less than $4. That’s pretty low “wages,” for a disgusting chore that I hate. On the other hand, I’m glad to grow a garden, can produce, and cook from scratch to save what I can on groceries, while providing better food for my family. Public transportation, I will be getting myself a beautiful red Toyota Prius and I would never set foot on a bus again. It is a time thing for me, I save 75% of my time if I drive. More dish network channels, international phone call on my home phone ohhh!!! And that big red washer and dryer set you see in magazines and the moment you enter any of those large electronic stores (they are energy saving). 😀 Okay I am in the happy zone I will leave now. I don’t think frugal should mean deprived, unless you are frugal for a very specific goal (ie, paying off debt). But if “frugal” is a lifestyle, then you are already incorporating the things you want. Being frugal can also mean enjoying the occasional splurge, as long as you truly enjoy it and it doesn’t make you feel guilty. I’m frugal mostly for my mental health (stuff really stresses me out) and also for the environment. My one splurge would be a housekeeper (then you don’t need a dryer either). The only reason I don’t have one is that my frugal lifestyle includes living in a group house with roommates, and they don’t need a housekeeper. I don’t think that saving money has to be about depriving yourself either. By saving in one area of my budget I’m able to put the amount I save towards something I really like, want, or need that’s more expensive in another area of my budget. But if money were no object, I’d hire someone to help me do the parts of my home improvement projects that I’m not fond of doing like painting rooms or to finish a project that’s stalled like landscaping so I can do more design type work. Frugal to me means not being wasteful and I can’t ever see myself wanting to be wasteful. In that way it is a necessity and always will be. How I practice frugality might change, though, with more money or other resources. For example, I’d like to spend more on higher quality items that fit my needs better. I try to do that now to some extent, but sometimes I am limited in my choices. If I had the extra money I think I would start taking my grand babies to the movies once a week again. We now rent movies & have a girls night at home with pop corn & juice. All bought on sale with a coupon of course. This is fun but not as fun as going out to the movies! That is what I would do if I could!